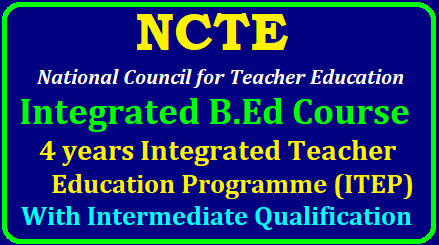 Integrated Teacher Education Programme (ITEP) 2019 | NCTE 4 Years Integrated B Ed Course with Intermediate Qualification | 4 Years Teacher Education Programme (ITEP) 2019 Apply Online from December 3rd | NCTE Integrated B.Ed Course 4 years Integrated Teacher Education Programme | NCTE B.Ed Course with Intermediate Qualification | NCTE 4 Years Integrated Teacher Training Programme (ITEP) 2019 (integrated B.Ed Course). It proposes to launch a 4 Years Integrated Teacher Education Programme (ITEP), for which entry qualification is 12" standard with 50% marks. The ITEP imbibes some of the best practices of teacher education in the world and aims to bring about a qualitative change in preparation of teachers for the school system. Secondary or plus two examination or its equivalent, are eligible for admission. shall be made within one month from the date of commencement of the programme. charge donations, capitation fee, etc. from the students.